Are you looking for classroom activities that will bring together science, technology, engineering, and mathematics in one integrated experience? The solution could be at your fingertips – gel electrophoresis! 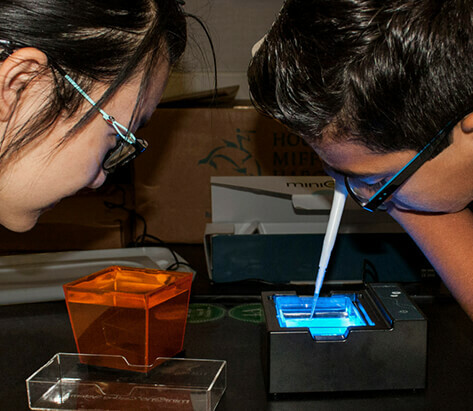 Electrophoresis typically enters the biology curriculum as a tool for separating DNA. However, the engineering and operation of the electrophoresis system draws on a range of disciplines, including chemistry, physics, electrical engineering, and materials science. 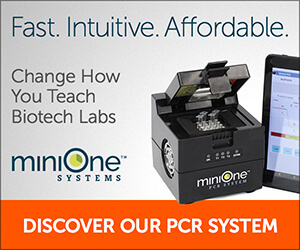 The design of the MiniOne Electrophoresis System provides rich connections to cross-disciplinary engineering principles, since every detail was optimized to provide research-quality results within a classroom period. Our recent workshop at the Bio-Link Summer Conference took participants on a journey through the design of the MiniOne Electrophoresis System, exploring the chemistry of running buffers, the selection of materials for electrodes, the relationship between voltage and electric field, diffusion, heat exchange, and many other scientific topics. Want to learn more about the STEM behind the MiniOne? Check out our workshop at the NSTA STEM Expo in Philadelphia “Real-world Product Development as an Integrative STEM Experience” (Friday, July 13, 1:30 pm in Room 103B). By its nature, biology is an integrative science that draws on math, physics, and chemistry, so why shouldn’t the biology classroom be a hub of interdisciplinary learning and innovation? This deep dive into the design of this powerful classroom technology may inspire new ways to connect STEM principles to your current biology curriculum. Click here for more MiniOne STEM ideas!